Employment coaches have been placed in six GPs’ surgeries in Islington. ‘Jobs on prescription’ is part of toxic and dangerous government plans to merge health and employment services – putting the Jobcentre in the NHS. Boycott Workfare, Mental Health Resistance Network, and Disabled People Against Cuts will be protesting the scheme from 3pm on 4th March, outside City Road Medical Centre. For more details on the protest and our reasons for opposing the scheme, see the Facebook event, this co-written article on the DPAC website and this letter from a GP about work cures and the duty to #DoNoHarm. 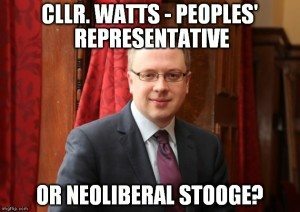 This guest post is an open letter from Mental Health Resistance Network to the leader of Islington council, Richard Watts. As you are aware by now, the Mental Health Resistance Network are involved in the organisation of a demonstration due to take place outside the City Road Surgery in Islington on March 4th. The protest is intended to voice our disquiet at the introduction of Job Coaches into 6 Islington surgeries, in a pilot project which has been enthustiastically promoted by yourself and Dr. Josephine Sauvage, a GP at City Road surgery, and Joint Vice Chair (clinical) of Islington CCG. We first learnt about this pilot in an article in Pulse Magazine, and immediately suspected that that the DWP were likely to be central to this scheme. Our suspicions were confirmed when we found a document, authored by Kay Peat, the CCG Employment Lead for Islington CCG. The document makes it clear that Ms. Peat’s job is directly funded by the DWP, and that the Working Better’ pilot which you and Dr. Sauvage were promoting is also directly funded by the DWP. Furthermore, Ms. Peat’s document confirms that Remploy, a company mainly owned and controlled by Maximus, have been engaged to provide the Job Coaches that Dr. Sauvage says she will be ‘prescribing’ to her patients. Maximus, as I am sure you are aware, have taken over from ATOS, in conducting Work Capability Assessments for those claiming Employment Support Allowance. What you may not know is that we at the MHRN instigated a judicial review of the WCA which found that the procedure “disadvantages people with mental health problems, learning disabilities and autism”. Almost two years later, the DWP has taken no significant action to bring that disadvantage to an end. In the interim, people with mental health issues in the ESA WRAG have also been subjected to an enormous number of sanctions. Researchers from Herriot Watts University have shown that the WCA continues to place those with Mental Health difficulties at “a substantial disadvantage. A document by your Assistant Chief Executive (Strategy and Partnerships) also confirms our suspicion that the Islington pilot is specifically aimed at people with Mental Health issues seeking medical treatment: “Mental ill-health is the major reason for people claiming ESA, so it is suggested that the focus is on this group”. People with Mental Health issues already have a lower life expectancy of 15 to 20 years, and we are against any merging of health of job seeking services which would make it more difficult for them to access health care. We constantly talk to people who say that they need their Mental Health symptoms to be dealt with before they feel ready or able to start looking for work. Frankly, when you are suicidal or being abducted by aliens work is the last thing on your mind. We were thus interested to read your recent statement that our “fears about the scheme were “misplaced” because it was “entirely voluntary and not linked, in any way, to any welfare-to-work conditionality or sanctions regime”. This was coupled with a claim by one of your council spokespersons that ” he had been told by Remploy that it was “a completely separate company and brand” to Maximus, and that “Maximus have absolutely no involvement in the Working Better project and none of the coaches are from Maximus”. So, as the Remploy website proudly notes on its front page, it works in partnership with Maximus. The statement by your spokesperson does not bear up to scrutiny, and neither, it would appear does your own claim that the DWP funded-, and Remploy/Maximus-run scheme is “not linked, in any way, to any welfare-to-work conditionality or sanctions regime”. As we have already noted, Mental Health claimants are placed at a substantial disadvantage in the WCA process, administered by Maximus and the DWP, and those who score 15 points and are then placed in the WRAG group are at serious risk of being sanctioned by the very same DWP which is funding the pilot in your Labour Borough. You have asked us to suspend our action and to meet with you to discuss the scheme in more detail. We are unlikely to do so. As Ms. Peat notes, “The pilot started in September 2015 and is due to finish in September 2016. No formal evaluation of the pilot is planned however it is being used as a pre-trial for the Supported Employment Trial”. This means that it is then likely to be rolled out in other areas, and we are intent on doing our utmost to persuade GPs not to get involved in the scheme. We are aware that to date the DWP welfare reforms (many of which were initiated when your party was in power) have led to many MH claimants having their benefits slashed, being sanctioned and a significant number of deaths. Very few long term MH claimants have actually moved into jobs, and we long ago gave up on being swayed by the rhetoric of welfare reform and austerity, we focus instead on what we see actually happening to ourselves and others. We know that GPs such as Dr. Sauvage bear witness to the difficulties people facing MH difficulties face in securing actual appropriate treatment for the issues they struggle with, as patients are being discharged from secondary care back to primary care at an alarming rate, MH budgets are being slashed and at best most patients can expect superfical interventions such as time limited referals for CBT or to the ‘Hubs’ being trialled in other Labour Boroughs such as Lambeth (where the Hub is based in the Streatham Job Centre) and Southwark (where the Hub is based in the so-called Employment Academy). We marched against the introduction of CBT inside Streatham Job Centre, and now we learn that as part of your Islington scheme, there are also plans for CBT to be provided in the DWP Job/Sanctions Centre. No doubt as a councillor you have come across people who experience thses difficulties in your own surgery. Another of your claims is that “We know that employment is one of the best ways to tackle poverty”. Again this does not bear up well to scrutiny, with a marked increase in in-work poverty and the growing likelihood of Universal Credit claimants facing sanctions if they cannot secure longer hours or higher wages. We have also seen a rapid increase in the use of zero hour contracts. Until you are ready to start having real discussions about the real issues we are stuck with having to organise demonstrations in order to bring attention to the complicity of elected Labour officials such as yourself with the “welfare-to-work conditionality or sanctions regime” that you so clearly are engaging in and promoting. Let us know when you are ready to do more than verbally distance yourself from the very same ‘welfare-to-work conditionality or sanctions regime’ you have elected to partner with and promote. In the meantime, we will see you across the barricades. Campaigners from Disabled People Against Cuts, Mental Health Resistance Network and Boycott Workfare will meet outside City Road Medical Centre (190-196 City Road , London, EC1V 2QH) on Friday 4th March from 3pm. See the Facebook Event Page for further details. If you can’ t get there on the day there will be an online protest – further details will be posted on this page nearer the time. Please also support the thunderclap for the protest.